Posted on Wednesday, October 24th, 2018 in Diamond, Informational. Are diamonds actually rare? Is lab-grown better than natural? Are “conflict diamonds” still a thing? Will the price of lab-grown diamonds continue to decrease over time? Here’s everything you need to know about the diamond industry in 2018. 1. Natural diamonds are getting rarer every day. Diamond-bearing kimberlites, which are underground volcanic pipes where most natural diamonds are found, are becoming increasingly difficult to find. 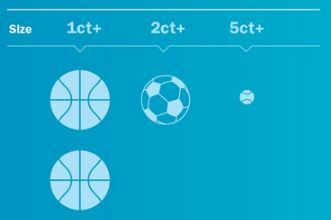 In fact, the annual volume of 1+ carat diamonds produced is equivalent to the volume of two basketballs. For diamonds weighing more than two carats, that annual volume decreases to one soccer ball. And for all the diamonds weighing more than five carats, the annual production volume can fit in a tennis ball. 2. Diamond demand has never been stronger. In fact, 2017 was the strongest year ever for diamond jewelry in the world and we expect to see similar, if not more impressive numbers for 2018. The majority of couples are still choosing to select a billion-year old diamond over other gemstones (including lab-grown diamonds) for their engagement rings and other fine jewelry. This can be attributed to the fact that many people recognize the emotional meaning that is evoked by diamonds and associate the gemstone with authenticity, rarity, and preciousness. 3. Conflict diamonds are a thing of the past. African rebellions have receded and the industry has put in strict controls, like the Kimberley Process, to ensure that no diamonds coming from conflict-zones are traded. In addition, all of the major diamond producers have safeguards in place to guarantee their diamonds are produced responsibly. 4. The diamond industry plays an important role in the world. This industry supports the livelihood of over 10 million people around the world, including 1.5 million artisanal and small-scale miners and their families in Africa and South America. In just one example, the discovery of diamonds in Botswana has transformed the nation from one of the poorest countries in the world to a middle-income country. The diamond industry in this country represents a third of Botswana’s GDP and provides funding for schools and hospitals. For more information on how diamonds are positively impacting the world, click here. 5. 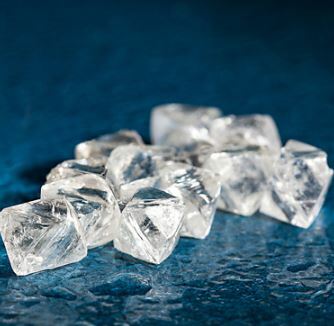 Lab-grown diamonds are not identical to natural diamonds. Even though they have the same physical and chemical properties as natural diamonds, lab-grown diamonds are not as valuable and are easily detectable. The production methods used to create lab-grown diamonds leave growth marks and telltale signs that distinguish them from their natural counterparts. 6. The value of lab-grown diamonds continues to diminish year after year. 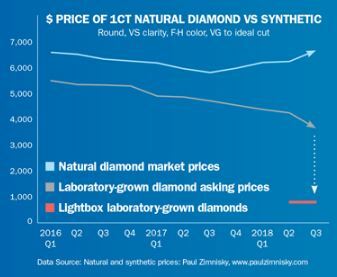 As expected, the technology used to make lab-grown diamonds has improved over time, and thus reduced production costs, leading to declining retail prices. In addition, the arrival of De Beers’ Lightbox has set a new all-time low standard for lab-grown diamond pricing. If the lab-grown diamond industry is anything like the lab-grown colored gemstone market, we can expect the price of these created diamonds to eventually fall to 10% of that of natural diamonds. So what does this mean for the average consumer? It means that if you buy a lab-grown diamond today, chances are that same lab-grown diamond would cost you much less had you purchased it a year or two later. Unlike lab-grown diamonds, the value of natural diamonds remains stable over a short time period and will increase in value over time. 7. Despite what certain lab-grown diamond companies claim, lab-grown diamonds aren’t more environmentally friendly than natural diamonds. For example, the carbon emission for a one carat lab-grown diamond is similar, if not more than that of a one carat natural diamond. Think about it. These companies primarily use electricity generated by fossil fuels. That’s not exactly the friendliest impact on the environment. For more information on diamonds, contact Kloiber Jewelers at 414-276-2457 or info@kloiberjewelers.com. To see our diamond jewelry collection, click here.